Centrally located on the seafront opposite the beach and Limassol's promenade and a 5 minute stroll to the Marina and Zoo. This recently refurbished modern 2 bedroom 1st floor apartment has a fully fitted kitchen, sitting and dining area, Wifi, satellite TV. Double sofa bed in living room can accommodate 4 adults or a family of 5. Ideally situated for all holiday makers and close to amenities, public transport, cafes, restaurants, shopping and sightseeing. A/C in main bedroom and living area. Hello, my name is Mario and I live in sunny Limassol with my family. Because I love travelling and meeting new people I also know how important it is to feel welcome when you arrive, therefore I do my utmost to make your stay as enjoyable and comfortable as possible. Being a local I am always on hand to assist you with finding the right places to visit and can help you with airport transfers if required. Please feel free to contact me anytime with any questions or help. We fell in love with this property as soon as we saw it due to it's natural light and location opposite the sea. It took us several months to renovate the apartment to a high standard with all it's requirements. With it's central location and great sea views it's a perfect holiday location and just a 2 min. walk to the sea & Limassol Promenadeand a 5 min walk to the Zoo or New Marina. It's a light & airy apartment on the 1st floor. Double bedroom with sea views, single bedroom and a double sofa bed in living room, ideal for 2. Fully fitted kitchen with all appliances. Sitting and dining area with Wifi, satellite TV. Secure building, parking. Close to all amenities, cafe's, sightseeing etc. Enjoy views of the sea from the balcony and main bedroom. The apartment is situated opposite the beach and Limassol's main Promenade close to restaurants, cafes, bars, shops and all amenities. A/C available in bedroom and living area. A/C provides heat as well as cool air. Fully fitted with all appliances and utensils. Kindly note that there is a minimal charge for electricity which is to cover a/c use at .30c per kwh - the meter is read on arrival and departure. Water is included (no charge). WiFi and satellite TV are inclusive. Beach towels are provided along with a cooler bag if required. The apartment was well situated overlooking the main promenade and sea. the apartment had everything we needed for our 10 day stay and was immaculately Clean. Marios met us at the airport and couldnot have been more helpful. He left a useful welcome pack and a brochure giving helpful hints and suggestions for our stay. We were 20 minutes stroll along the beautiful promenade to the old port and marina or 5 mins on the No. 30 bus which ran every 12 minutes. We went to Paphos one day by intercity bus and Omodos a delightful mountain village another day also accessible by bus. Bus fares are very cheap. There were plenty of restaurants and bars in walking distance and we did not need a car. The apartment had wifi. Thank you Marios for such a welcoming stay. We stayed 18 days and even in the winter there are so many restaurants and places to visit and most close at hand. A comfortable well equipped apartment. Perfect location! Great apartment! Wonderful host! The apartment is perfectly located to everything we needed and we loved relaxing on the balcony watching the sun go down. Great sea views. The Marina is only a few minutes walk and is great to visit either day or night. The Old Town is located just behind the apartment so was also a few minutes walk which was stunning to walk around at night, so we hardly needed the car. Our host Mario really went out of his way to make us feel welcome with his warm hospitality and wonderful welcome basket. Nothing was too much bother for him and was always available to answer any queries we had. Thanks so much! Looking forward to rebooking again! 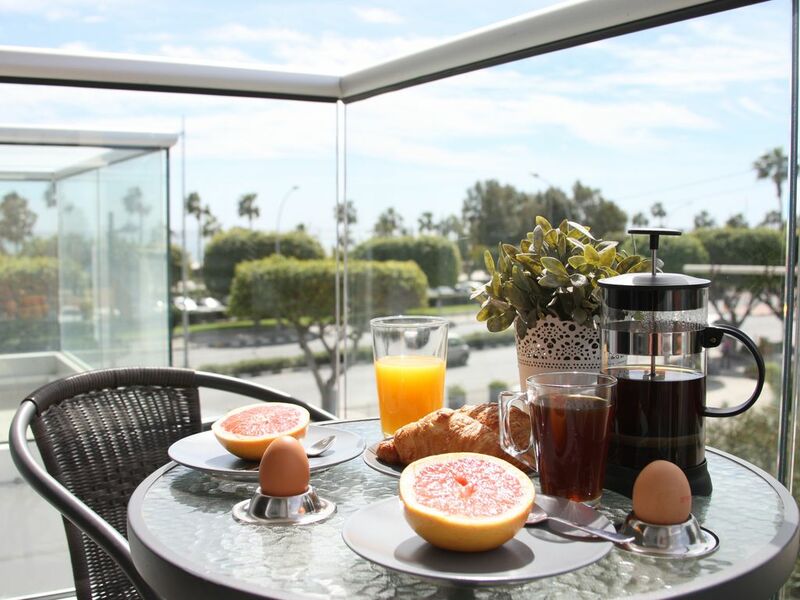 Located opposite the beach and Limassol's main Promenade with a short stroll to the Zoo, Old Harbour, Old Town and New Marina, this apartment is perfectly situated for all tourists.